I am always on the lookout for new activities to do with Mason. Since his attention span is still pretty short, quick activities that produce results is best for both of us. I have found a bunch of activities I will be posting as I go through them with Mason, so stay tuned. This one is perfect for the Summer! It's nice to offer a different medium to create with, other than the usual chalk , crayons, or markers. 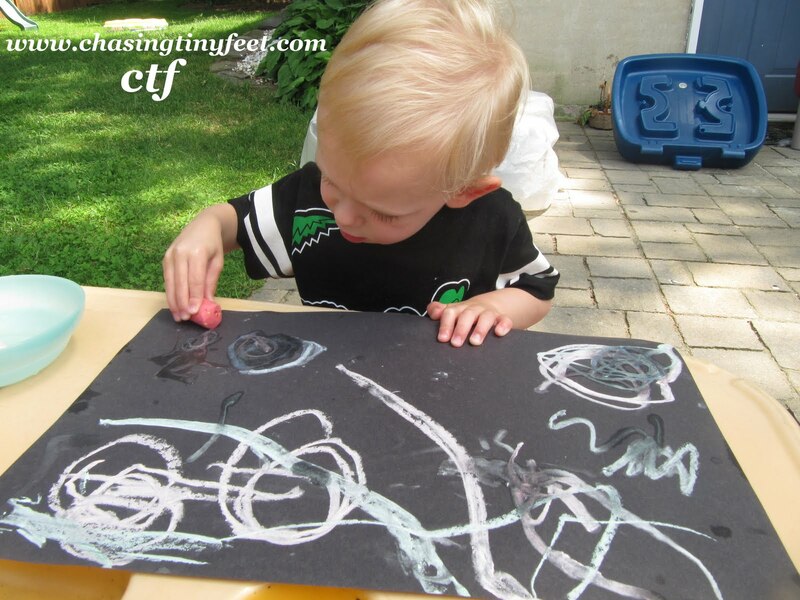 Mason is familiar with chalk and this activity just added a twist to the usual. The suggested length of this activity is 15 minutes, which is exactly about how long Mason lasted before he was up playing in his sand table. 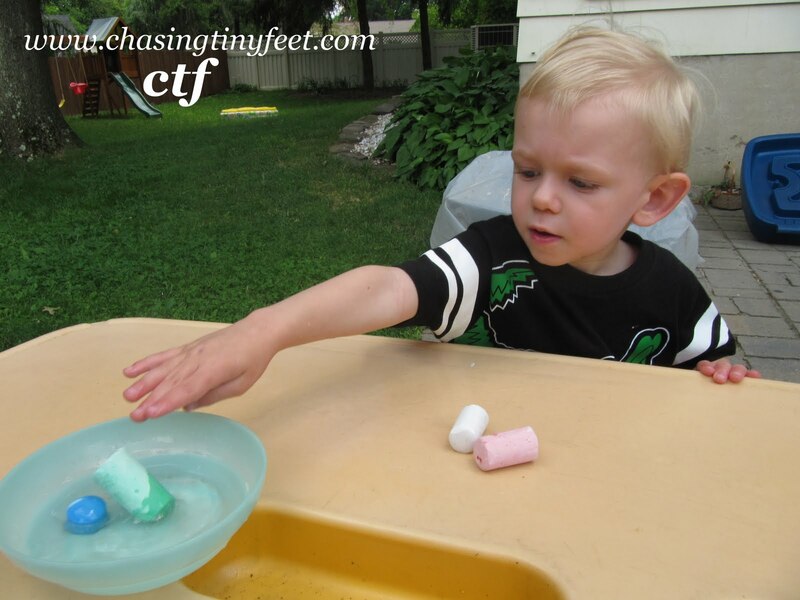 All you have to do is let your child put the chalk in the water and let it sit for about 1 minute. Once the chalk is wet, show your child how to color on the paper - don't press too hard or the paper will tear. The wet chalk will look like pastel paints! Now that I am a Mom, pampering myself is something I rarely get to do. Anyone who has or remembers what a 2 year old is like in a typical day will understand. I was delighted to find out that I would be to try some new products from the Aquafina Skin Care and Bath & Body Line. Pampering was just what I needed! I admit that I have a collection of different lip balms. I think it is mostly because I have not found that I really liked or worked well for me. I believe my problem has been solved with Aquafina's Lip Oil. The first product I tested was Aquafina's Hydrating Lip Oil. I have heard of lip balm, but lip oil? I put a little on my lips, not knowing what to expect, and I was pleased with the wonderful aroma on mint. This gel glided on easily and did not leave my lips greasy, but perfectly hydrated and moisturized! I did not need to use alot either. Once the oil set on my lips for a few seconds, I got a tingly feeling on my lips from the menthol in the product. It felt nice on my lips and only lasted for a short time. The consistency of the lip oil is like a gel, which is nice because you do not have to reapply it very often. I find that with lip balm I am always applying and reapplying it. I was able to eat and drink throughout the day and only had to apply the lip oil a couple of times. I also liked that Aquafina's Lip Oil contains natural botanicals including, Jojoba Oil, Vitamin E and Almond Oil. Not only is this a great moisturizer, but it added a bit of shine to my lips. The next two products I tried out were Aquafina's Purifying Daily Cleanser and Daily Balance & Clarity Toner. The cleanser was a breeze to use. I pumped the applicator 2 or 3 times to get an adequate amount of the cleanser into the palm of my hand and applied it to my face in a circular motion. It lathered very nicely and it was light and refreshing on my face. I rinsed with water and I was happy to see that the cleanser rinsed easily and thoroughly. My skin felt smooth, clean, and hydrated. After I washed my face, I applied the toner with a cotton swab. In case you are not familiar with what toner does, it helps to " tone and clarify the skin, minimize the appearance of pores, helps remove excess oils, makeup and daily buildup". Right off, when I opened the bottle, this toner had a refreshing scent. It is also enriched with botanical extracts. My face instantly felt cool and soothed. I have been using this toner and cleanser every night since I received it and have found that it is very gentle and non-drying. I would highly recommend Aquafina's new line of Skin Care and Bath & Body line to anyone looking for something new and works without the drying effects of alot of products on the market. The lip oil retails for about $1.99 and the cleanser and toner retail for about $5.00 each. Check out more about these products online at Aquafina's Skin Care. Aquafina provided me with the items above in order to facilitate this review. All opinions are 100% mine.